The online auctions giant eBay is huge in France. And even for an Englishman like me, it’s easy to hop in and join the fun. Just have to be careful with my wallet. Here’s how to change to English in 2019! Please note! Some products on the French eBay store are not delivered outside of the country. For delivery beyond france, click here to find out more. It’s very possible to use eBay.fr in English. While native language support is not available, I would recommend translating the whole lot with Google Chrome. Just have the default language setting to anything else then French and it will ask to translate the page automatically for you. While I am not a fan of Chrome in particular, this feature beats the rest of the browsers where you have to download a separate plug-in/add-on type of thing. This is the fourth biggest e-commerce website in the whole of France. Just after Amazon.fr, Cdiscount & Fnac. It’s simply massive, with more than 10 million visitors per month, buzzing with online commerce. Auctions, buy now products, new and old. As well as the everything between heaven and earth type of thing. Best of all, now that even smaller sellers are taking the advantage, it has become a one of a kind place for shopping French made goods. With such variety in abundance, they have created competition, and competitive prices that is good from the consumer point of view at least. There simply isn’t any equivalent that can match to the auction services available. One familiar stop might be the biggest online classifieds site in France, at Leboncoin.fr. Which can be an especially great option for finding used goods. Please, feel free to ask any questions. Comments form is below, Thanks! David. I have found Laboncoin to be full of scams and prefer not to use it. Thanks! Yeah, I can relate to having a bad experience with Leboncoin. Actually I am quite surprised that these kinds of sites with no consumer protection, or review system still manage to be so popular. It’s just a sort of “online bulletin board”, but it does have it’s benefits. Ummm… I have just clicked on ebay fr – yes, the site is in English but when I clicked to register it remains in French! I suspect all other instructions will be too! I don’t suppose that this can be overcome – even google chrome won’t translate it. If you want to use eBay.fr, then there is no choice but to automatically translate the pages. If Google Chrome isn’t working for you, a good alternative is to use Mozilla Firefox extension S3.Google Translator. Which is easy to install and use, similar to Chrome. Does that help? If I want to use ebay France will I have to re register and have a different user name than my British one and will PayPal work. Thanks Martin. If you already have an account on eBay.co.uk, you can login with the same user on eBay.fr and PayPal works the same as well. Cheers. I believe there are two ways for international ‘cross-listings’. One is of course to change to the French site and manually add a new listing with the same account. The other potential method is to use the ‘international site visibility‘ feature. There are certain rules for eligibility, if you pass them there should be an option to add additional countries and add their shipping costs. But I believe this is currently available only for US, Canada, UK, and Australia for the time being. I would suggest getting in touch with eBay to ask if they have (planned) support for France. I would like to know too! Dear, Sir/ madam. Please advice for me, how to complain for the seller, because 3 week ago I have buy some item on eBay from France, and still today I haven’t receive the item, but the seller has notice will send on time from 30/5/ to 03/6/2016. Please help and accept many thanks from me. Kind regards. You can go to “My eBay“, or if you are using the French version that would be “Mon eBay” at my.ebay.fr. In your purchase history, select the ordered item and look for the link “item not received” to open up the issue with the seller. If the seller doesn’t solve the issue in three days, you can contact the eBay Resolution Center and get a refund according to the Money Back Guarantee policy. I’ve usually had a very good experience with refunds. Hope this helps. I ordered an ipad 4 and sent a cheque 15 days ago. The material was not sent. The person said he did not get the cheque. So I sent another for 206€ 10 days back. Still he has not sent the i pad. where I should I write to cancell this. I am leaving the country soon. thank you for your help. Please, check my previous comment above yours. Same applies to this. You can find the “I didn’t receive it” link in French: “Mon eBay” –> “Autres actions” –> “Je ne l’ai pas reçu“. Hopefully the seller will agree to cancel. If not or there is a problem/dispute — eBay Resolution Center (In French: Gestionnaire de litiges) is your friend. Let me know if you have further questions. I’ll do my best to help out! Could you please tell me what you’ve tried so far? First, and easiest step is to get automatic translations working with the Google Chrome web browser. You should see something like below if you open up any page in French. And note that it doesn’t work if your Chrome is in French. 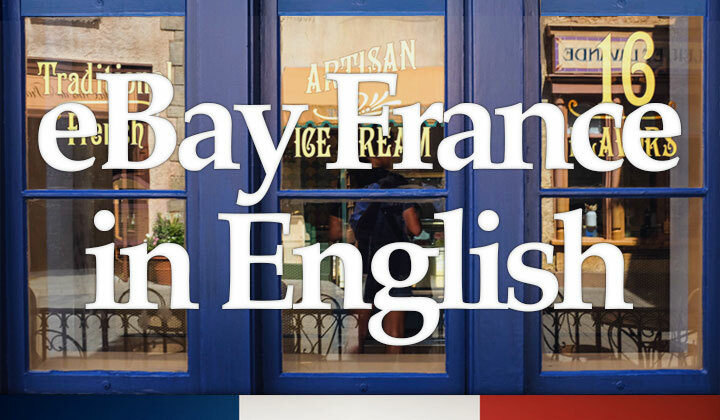 If I have a British e bay account can I trade in france .. within France or Europe? Where do I register? All eBay accounts are interlinked so you can use your UK login on eBay.fr and others without the need to register. You will need to combat the French only site to sell on there though, I would recommend using Chrome. So I am assuming that your Chrome browser is in French, which is why it’s not asking to translate the pages to English..? To change your default language to English on Windows — please, see these instructions, the bit under “Change the language of your Chrome browser“. Does that help? Found out that sometimes what is not available in the US eBay store can still get from the FR one… this is awesome for me! Hi. I notice that the sellers address is in the U.K. While on eBay.fr I notice that all the seller’s addresses are Uk based and not in France as I would expect. Am I doing something wrong? Thanks. Ebay is a minefield ,it offers no guarantees . Go and visit a decent antique shop that sells a quality product instead of buying fakes or reproductions online…Si ces objets sont en vente sur Ebay ,c’est parce qu’ils ne sont pas assez bons pour etre vendu en magasin. How do I Login to French eBay? You can click here to directly access the login page. Hi Carl. You can use the “Advanced Search Feature“. Then you can narrow down your search to Europe, and they will surely provide international shipping if the item is available. Hope this helps.